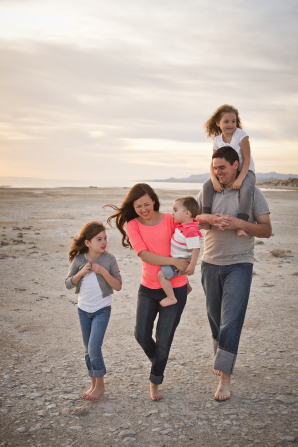 Modern Mormon Answers: How do the roles of men and women complement each other in families? I love knowing that God has a plan for me. The differences between my husband and myself are essential to raising a family. We temper each other, build each other up and love each other, unconditionally. Our children are witnesses to our love and devotion and I hope one day they will have the same blessings that we do. I'm so grateful to a loving husband who loves me and supports me in all that I do! The husband holds the priesthood the wife take care of the household and the children. Together they compliment each other. By keeping the convenants they made it strengthens and bless the family as a whole. The First Presidency and Council of the Twelve Apostles of The Church of Jesus Christ of Latter-day Saints, in their official statement entitled "The Family: A Proclamation to the World", provided greater clarity on the Lord's standard for families. Included in this statement are the following words: "By divine design, fathers are to preside over their families in love and righteousness and are responsible to provide the necessities of life and protection for their families. Mothers are primarily responsible for the nurture of their children. In these sacred responsibilities, fathers and mothers are obligated to help one another as equal partners. Disability, death, or other circumstances may necessitate individual adaptation. Extended families should lend support when needed." I love the different and arguably the better definition of equality this quote states. When people talk about equality, they think it means having the same things, attitudes, and everything else. However, the way The Family: A proclamition to the world" defines it, true equality has different skills, talents, voices, opinions, and roles. Equality is providing a place, an environment and space to allow these different characteristics and talents to dwell and grow their own unique personalities. I have always desired to become a stay at home mom and grow my skills to strengthen my home and my future kids. However, whenever I say this now, many look down on me--thinking I am lazy, wanting to take it easy, or somehow oppressed/brainwashed to think this. Instead of creating a place to treat all genders and people equal, sometimes the feminist act goes against some women by creating a stereotype of "equality" and forcing all women to want and partake of their movement to become the same as a man. I think it is important for people to keep in mind that equality doesn't mean making people fit a cookie-cutter. It is good to understand the roles Heavenly Father gave us and to utilize our talents and our skills to make the world a better place and to help draw others unto Him. I completely agree. equality doesn't mean you have to be equal in every aspect. Men and women are inherently different and we need to embrace those differences and find how they work together and complement each other. If we were all on the same level at the same time all of the time there would be no growth, especially in the realm of families. My husband and I are very different, but we work together to create a home that works for us. We acknowledge the strengths and weaknesses in the other. The only difference is we don't resent or become embittered because of them. We use them to help the other, and even love them for it. I think that the differences between my husband and myself really strengthen our relationship and that is a wonderful thing. Men and women are equal partners who have different roles that both contribute greatly to each other and to the family unit. This is such a hugely popular and sensitive topic these days. I think our own idea of the roles of men and women and mothers and fathers depends a lot on how we were raised and the social influences we had close to us as we grew as children. There are so many differing opinions on how it should go, but I think President Hinckley says it perfectly when he states the roles must compliment each other. I love the quote he uses from the Paul... "neither man or woman is complete without the other". I don't think we can state it so simply as women care for the children and men hold the priesthood. I will not attempt to articulate or explain all the reasons God asked men to hold the priesthood, there are many others much better able to do that than me, but I believe strongly it is for good reason and for no other purpose than to compliment the role of women. I really don't think God is saying men do this and women do that. We are eternal and the families we create are eternal and our responsibility and blessing is to combine ourselves to achieve eternal life regardless of the basic duties along the way. I was raised on a farm where my mother and father lived very traditional western values. My wife was raised in a more metropolitan neighborhood and her parents totally different than mine. We have both had to learn how to compliment each other. What I expect her to do isn't always what she thinks she should do and vice versa. However, we are so in love and have an eternal perspective that it allows us to adapt or learn how to make it work and it is a beautiful experience. Sorry to be a little long winded on this one. :) I think we all have strong feelings about this. I'm just glad we know there is a God and that he has a plan for us. I'm so grateful for the example of our Savior that teaches me how I should behave so as to compliment the role of women in my life.